A beginner class for the wee dancer, students will learn the basic arm positions and movements and of Highland Dancing. They will also develop their musicallity and memory skills. This is a 30 minute class. 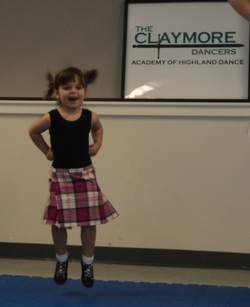 After learning the basics in Tartan Tots dancers progress to learn set steps and short dances. More emphasis will be placed on specific technique while still developing musicality and memory skills. Dancers will learn the Highland Fling, Sword Dance, Seann Triubhas, Highland Reel, Scottish Lilt and Flora MacDonald's Fancy. There will be an increased focus on refining technique as the dancer becomes more skilled. Dancers will also develop pose, strength and self confidence. Dancers will refine their highland dance technique and learn more steps for the dances that they learned at the Beginner/Novice level. They will also learn more Scottish National dances as well as the Sailors Hornpipe and Irish Jig. More focus will be on increasing strength, stamina and performance skills. These classes will prepare the dancers for choreography competitions and community performances.